Another case of statistical manipulation. 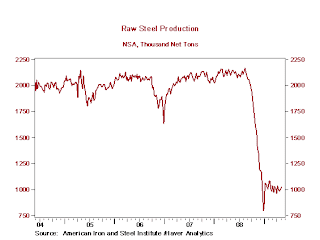 No doubt there is a decrease in steel production but the base of graph is not 0 but 750 thus artificially magnifying the decrease. Secondly, it would have been useful to know what the pattern was in the previous downturn (2000-2003) and what happened in 2010? There are a lot of economic activity charts with 50% declines (like this one) in the 2008-March 2009 timeframe.